This sauce has become quite a hit in our home. As I mentioned yesterday, I originally made this sauce intending to toss it with raw zucchini noodles, similar to a raw Pad Thai dish. The noodle dish didn’t turn out quite as well as I had hoped (it was too watery), but the sauce tastes so wonderful that I want to pour it over everything else! Whether it’s served over chewy kale leaves or crunchy romaine lettuce, this slightly sweet and spicy sauce makes nearly any vegetable taste better, with a bit of Asian flare. In lieu of peanut butter, which can be more difficult to digest, I’ve paired creamy almond butter with tamari (a gluten-free soy sauce), honey, and sriracha to create a downright addictive flavor. Best of all, this sauce is easily adaptable! If you prefer a sweeter, spicier, or saltier sauce, you can simply add more honey, sriracha, or tamari to suit your taste– guaranteeing that you’ll never wind up with a recipe flop. Get ready to dig in! A slightly sweet, salty and spicy dressing that will add a delicious Asian flare to any dish! Like I mentioned above, this recipe is very adaptable, so feel free to replace the almond butter with any other nut or seed butter of your choice. For a vegan sauce, try using maple syrup or coconut nectar instead of honey. Reader Feedback: Do you like spicy dishes? One of my favorite dishes when my husband and I started dating was a green curry that was so spicy, it made my eyes water and my nose run throughout the whole meal! But, it was so worth it. I have been making this a lot lately it’s so amazing. I use maple syrup in place of honey as my honey is always crystalized and hard and I find honey never does a good job at sweetening stuff. Made this for a sauce for a package of Broccoli Slaw. I made three alterations: did not use any sweetener, used Sunflower Seed Butter, and was out of Srichacha so used Tabasco. It came out amazing!! A very adaptable recipe and tasted like I was eating something so rich! YUM! Thanks for the new Fav recipe! I am absolutely OBSESSED with this sauce. HELP! I made this and not sure what went wrong but the consistency came out super thick?? any suggestions on what will dilute it? thx! I’d just try adding some water or extra tamari until it’s the consistency you like– but be careful to not add too much liquid, as this sauce tends to stick better to noodles and veggies if it’s not too watery. I made this yesterday and used it as the sauce for a chicken/veggie stir fry over sweet potato spirals. We didn’t have Sriracha on hand, so I used Frank’s Red Hot Sauce. Wow… it was delicious!! The combination of this sauce with the broccoli and chicken was amazing. I am already looking forward to my leftovers for lunch today! I froze the left over sauce in an ice cube tray for an easy dinner next time. Thank you, thank you, thank you for this tasty recipe. It will be a staple! I made this yesterday and poured it into a glass bottle to store in the fridge but I noticed this morning that it has practically solidified!! Will it be ok if I take it out of the fridge and shake it with some water when it comes to room temp? Yes, it should thin out naturally if you let it thaw at room temperature, and if you plan on adding it to vegetables, you might just try tossing the thick sauce together with them, before adding any additional water. Vegetables tend to release liquid as they marinate, so that will probably help thin the sauce naturally. This was delicious! I omitted the garlic just because I thought it tasted good w/o it. We are completely all-sugars-free (whole 30), right now. Can I use dates in place of honey? Sure! I would just add some water and pulverize it all together in the blender. Sounds delish! 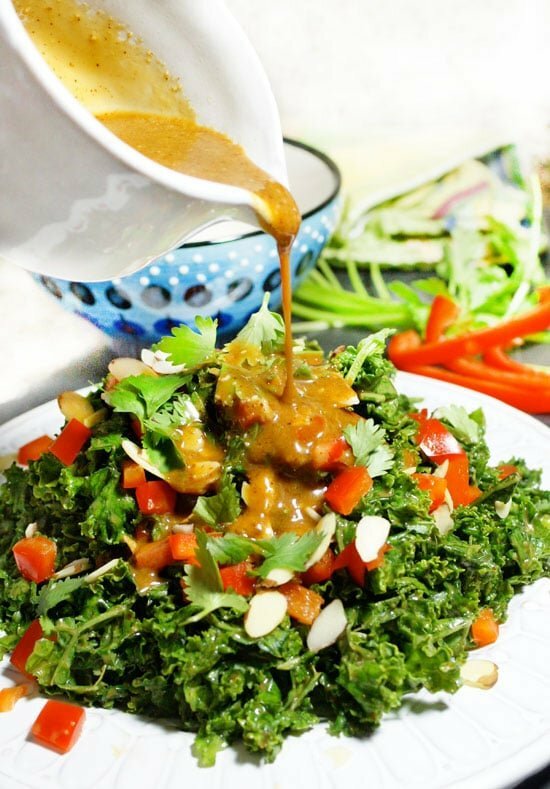 I made a satay sauce salad dressing recently that was such a good change from standard dressings – but this looks yum to will need to give it a go with almond butter instead of peanuts! Thanks so much for sharing this recipe. I made it today to have with salad for our main meal and it’s a keeper. So nice…………….. This turned out fantastic! I’ve been boarder-line obsessive about your honey mustard dressing (my boyfriend keeps asking me when I’m going to make another kind! 😉 ), but this was just as delicious, and the flavor combination was complex and satisfying. It has an almost meat-like heartiness to the flavor, so I will definitely be making this for my salads in the cooler months when my body craves heavier meals. I only had crunchy almond butter, so I popped the ingredients in my Nutribullet along with a few tablespoons of water to curb the thickness, and ate it over a kale salad. Heaven! This was really good. I used peanut butter and stevia instead of honey. Mine came out very thick so I had to add lots of water to thin it out but it still tasted great. 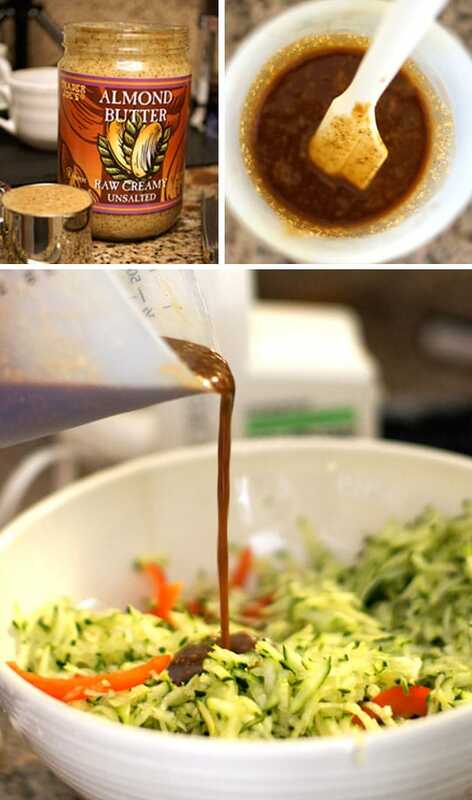 You always make the best sauces and dressings. Thank you!! I’ve noticed that I seem to eat a lot less when I eat spicy food, seems to satisfy more?!? 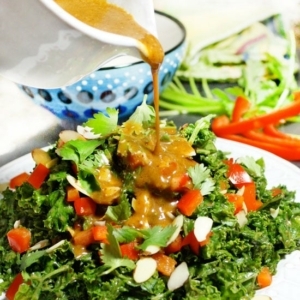 Making this for Father’s Day, I know that sounds weird (shouldn’t we be grilling) but Asian peanut sauce flavor food is my husbands ultimate favorite, always have to hit up an expensive restaurant so he can get his fill. Why not make this instead? So cool. And I’ve never met a man who didn’t love love love peanut butter flavor. Never! Yum!! I love that you are using almond butter in this! Will be amazing on top of Zoodles!!! I’m going to make this tonight! I’ve been craving Vietnamese food all day and refuse to order chemical laden takeout and I’m on a mission to not eat out for 30 days! I think that sauce would be great with some Mai Fun brown rice noodles with stir fried veggies! Thanks! oh, and fresh GINGER! don’t forget that. This looks delicious! I can’t wait to make it and try it!